The Rational Unified Process, Third Edition, is a concise introduction to IBM's Web-enabled software engineering process. Rational Unified Process®, or RUP®, Lead Architect Philippe Kruchten quickly and clearly describes the concepts, structure, content, and motivation that are central to the RUP. Readers will learn how this approach to software development can be used to produce high-quality software, on schedule and on budget, using the Unified Modeling Language (UML), software automation, and other industry best practices. The RUP unifies the entire software development team and optimizes the productivity of each team member by bringing them the experience of industry leaders and lessons learned from thousands of projects. It provides detailed and practical guidance through all phases of the software development life cycle, but it is not inflexible. The RUP can be tailored to suit a wide variety of projects and organizations. This new edition has been updated to reflect all the changes integrated into the latest version of the Rational Unified Process--RUP 2003. It includes a four-color poster that lists key RUP elements: disciplines, workflows, artifacts, phases, and milestones. The RUP Builder with enhanced configurability, process views, and three base configurations. MyRUP, enabling personalized views of the RUP configuration. Additions to the Rational Process Workbench, used to define process components, perform modifications to the RUP, and create process plugins. The introduction of a separate Process Engineering Process offering guidance on adapting the RUP, creating plugins, and deploying the RUP. The Rational Unified Process, Third Edition, is a reliable introduction to the Rational Unified Process that will serve project managers and software professionals alike. 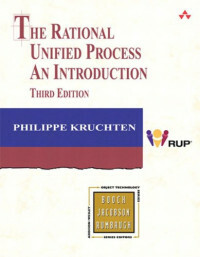 Philippe Kruchten is the lead architect of the Rational Unified Process. He has more than thirty years of experience in the development of large software-intensive systems for the telecommunications, defense, aerospace, and transportation industries. His book The Rational Unified Process: An Introduction (Addison-Wesley) has been translated into eight languages and has sold more than 160,000 copies in its two previous editions.